2018 was a year. Moving directly from field ops in 2017 with hauling hay in response to drought and fires, Operation Hay Lift continued through April 2018, assisting 47 ranching families just in 2018. 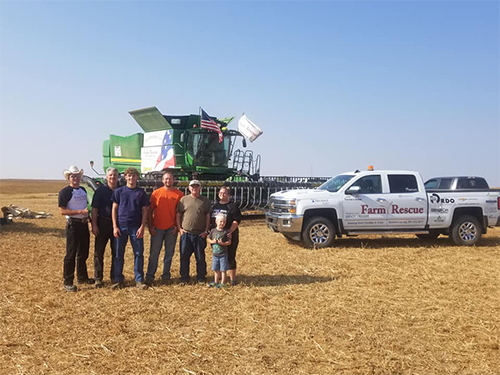 Planting operations began simultaneously with the OHL wrap-up, and after waiting for a dry spell, Farm Rescue was able to assist 16 farm families within a three week window. Haying and an early harvest merged together, and 20 additional families were assisted during those seasons. 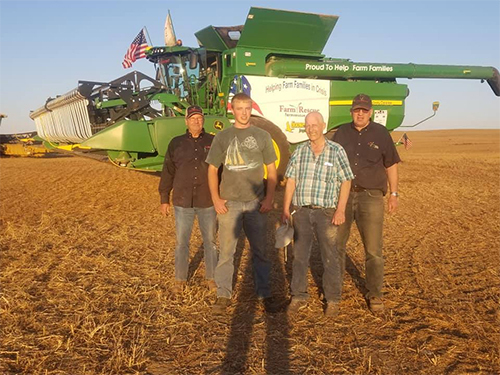 Harvest was hard for Farm Rescue, as it was for almost every farmer in the region, with continuous small amounts of moisture pushing harvest dates back for soybeans. Our operations finally wrapped up right before Christmas. Farm Rescue is proud to be able to have served 83 farm and ranch families this year, but that ability is only with the faithful support of our donors, sponsors and volunteers. The gifts of time, money, machinery, lodging, and anything that keeps the heartbeat of our mission alive are valued more than you know, not just by Farm Rescue but especially by the families we serve. 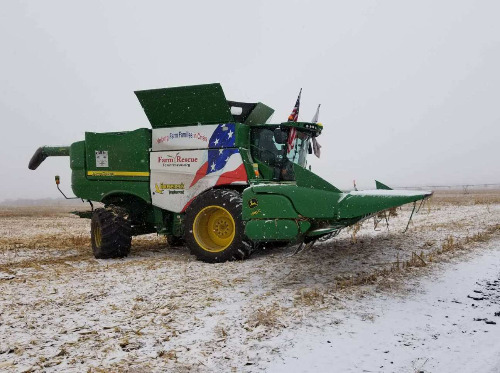 After finishing operations near Canton, SD, and while moisture came down once again, this time in the form of snow, our combines keep rolling. Snow and Corn was harvested around Bismarck, ND just to get the job done there. Despite days we couldn’t move at all and weather related breakdowns, we managed to finish the case for a farmer dealing with heart troubles. The other combine made quick time of finishing 400A corn harvest near Kensal, ND. Meanwhile, we await the moisture levels of the soybeans to reach harvestable rates. Thank you to all of our generous sponsor and volunteers who make this work for our mission possible. The volunteers in the field this time were Warren Rubingh, Jeff Slade, Alan Enger, Erv Geisler, Garry Deckert, Eldon Cresap, David Frueh, Mark Zaderaka, Albert Lautenschlager, Lee Van Ruler, Gary Krieger and Will Rudolphi. Thank You!!! We value each contribution. The last couple of weeks have been favorable for harvest, or at least more so than previously. We’ve moved on to corn harvest in Canton, SD for a farmer with a hip replacement, and then complications. We also all look forward to the banquet in Minot, ND tomorrow, November 3, as a time to reflect on the year and our supporters, as well as the good work we’ve been able to accomplish. Thank you to the following volunteers who gave of their time in the field: Warren Rubingh, Jeff Slade, Dale Lamphere, Clarence Kuss, Dave Frueh, Andy Jewett, Alan Enger, Erv Geisler, Lee Van Ruler, Jan Van Dam, Glen Haekenkamp, Lorn Wielenga and Paul Thom. We couldn’t do what we do without every Farm Rescuer! After another stretch of waiting for drier weather and doing a little bit of harvest at a time, we finally got back up to speed for a bit. We hope to keep the good weather so we can help as many farm and ranch families in crisis as possible this harvest season! Applications continue to come in, so we know there is a need and are helping as many as possible. Volunteers in the field have been: Warren Rubingh, Kenneth Chyle, Emil Baranko, Jim Cheze, Jeff Slade, Kyle Thormodson, Mark Danielczyk, Jerry Krueger and Dale Lamphere. Thank you to every Farm Rescuer: the volunteers, the sponsors, the donors and every other supporter! This month has proven difficult to get into the field with the added moisture. Bean harvest is getting pushed back, and low temperatures are coming early. A big thank you to our volunteers who are weathering this and working through it: on maintenance, repairs and getting ready to go again when we can. Volunteers who have been on site since last report are the following: Andy Wittenburg, Warren Rubingh, Rick Davidson, Mike Platt, Albert Lautenschlager, Mike Melaas, Kyle Thormodson, Tom Wallace, Galen Weisenburger, Eldon Cresap, LeRoy Spilde, Jeff Stremick, Ethan Theis, Emil Baranko and Kenneth Chyle. Your sacrifice of time is valued and appreciated! A great big shout out to all the sponsors and donors as well. We are always very conscious of our inability to do any of this without you as well! Another week has come and gone, and we are seeing a light at the end of the wheat harvest. The week started with Crew 1 moving to Grenora, ND and Crew 2 finishing up at Rocklake, ND. 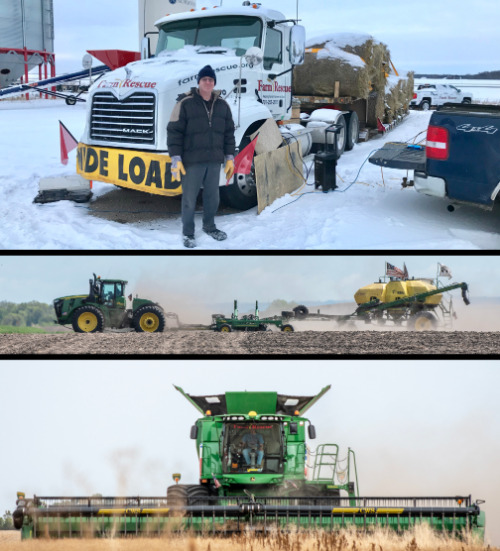 Other volunteers were dispatched to continue hauling straw by Hettinger, ND with still others bringing in crops by Baisdell, ND and Noonan, ND as the weather allowed. Volunteers on site this week (even through the holiday!) were Mike Platt, Jerry Christians, Dave Freuh, Gary Krieger, Glen Haekenkamp, Warren Rubingh, Leroy Spilde, Jeff Stremick, Mike Melaas, Rick Davidson and Albert Lautenschlager. A great big thank you for using your time and resources to help farm families in crisis! “Never curse the rain” is a quote I’ve heard and agree with, especially after the drought of 2017. Too much rain, and you lose some of the crop… Not enough rain, and you can lose the whole crop. We have seen wet conditions throughout our harvesting area this week. The Combine 1 crew is taking the opportunity to do maintenance on equipment and prepare for their move to Kenmare, ND, while the Combine 2 crew is waiting it out to finish up in Rock Lake, ND. We also still have volunteers ready to help when it dries up in Noonan, ND and Blaisdell, ND. From Hettinger, ND, we have the straw bales to move! The case farmer there donated the straw, so we baled it and are selling it as a fundraiser. Let us know if you need some straw and are in the area. =) A great big thank you to the volunteers who are at each of our cases, working hard this week! David Frueh, Will Rudolphi, Lee Van Ruler, Albert Lautenschlager, Mike Melaas, Dan Sullwold, Mike Platt, Jan Van Dam, Jerry Christians, Jason Reitz, Gary Krieger... You are the angels in blue this week! Thank you too our sponsors as well. Each one that supports us is truly a Farm Rescuer! Check out our webpage for a full list of our sponsors who make this assistance possible. I’ve heard it said that my updates are not always very timely. And that is true. I apologize. Please know that even when an update is not on time, our assistance still is! It is our priority to serve our farm and ranch families in a timely manner, and sometimes that means putting other things aside until we have a minute. 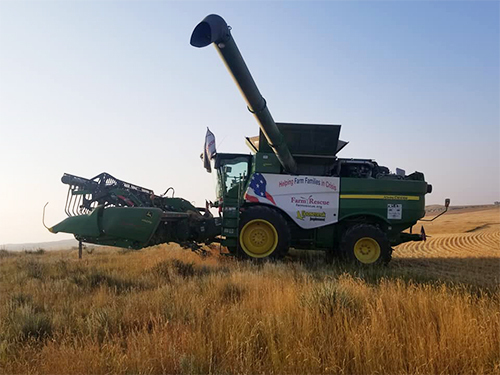 Our crews are still out there working hard on the wheat, and even getting some lentils harvested. 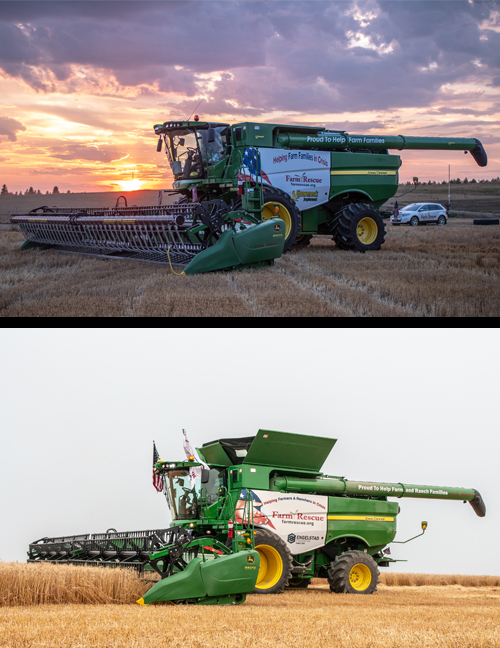 Combine 1 moved to Lindsay, MT from Hettinger, ND, and harvested lentils for a farmer who recently had heart surgery. Combine 2 started work harvesting more wheat at Rock Lake, ND this week. Volunteers were also dispatched to Noonan, ND and Blaisdell, ND to harvest wheat. As always, a huge thank you to the sponsors who make this all possible, and the volunteers in the field this week: David Frueh, Mike Platt, Pete and Pete Giambattista, Corey and Jenny Roth, Gary Krieger, Lewis Storm, Will Rudolphi, Lee Van Ruler, Mike Melaas, Albert Lautenschlager and Jeff Stremick! The hours are not all fun and games, but the work done in the end is a true blessing for everyone involved, especially those we serve. August 17, 2018 - Harvest is Here! 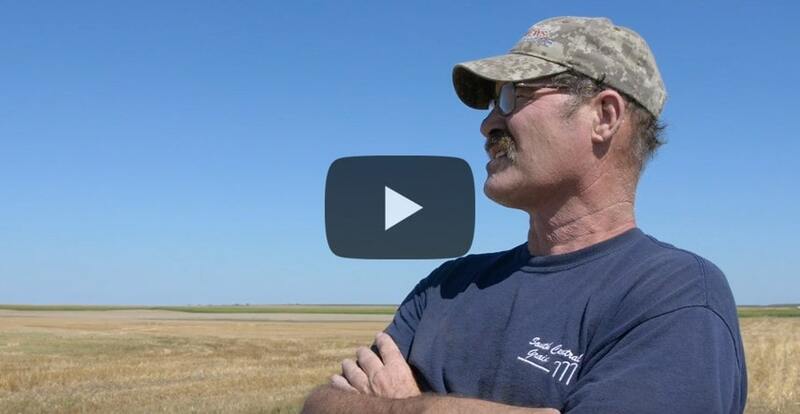 Farm Rescue’s harvest season is in a cloud of dust… wheat dust that is. 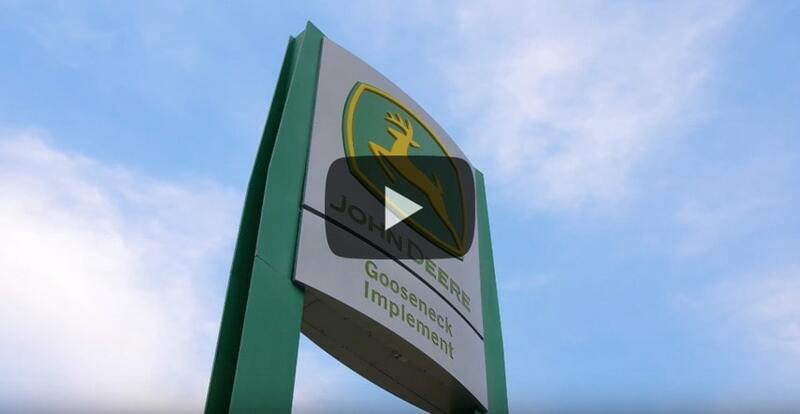 The Gooseneck-sponsored S680 combine is making trails in Hettinger, ND, where our volunteers are helping a young farmer who lost his hand in a farming accident. This farmer is actually donating his straw back to Farm Rescue, so we are baling it and selling it as a fundraiser! Thank you for giving back in this way! 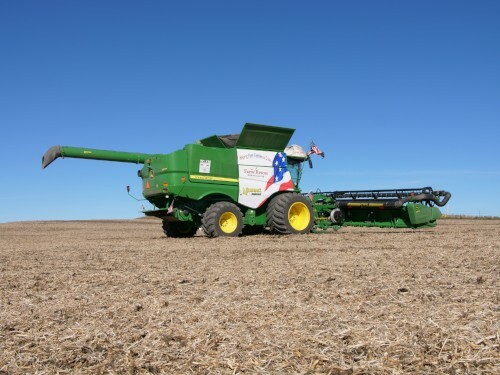 Our second combine, provided by the Engelstad Foundation, was taken out of the shed to help a farmer near Langdon, ND who is fighting cancer. A special thank you to Langdon Implement for supplying the header for this case! 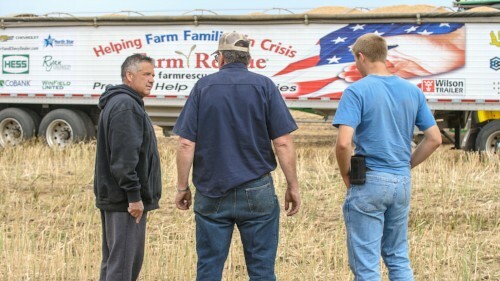 Farm Rescue also dispatched volunteers to Pekin, ND to help a family with haying and harvesting; to Des Lacs, ND to help with haying, as well as to Zeeland, ND to help with wheat harvest. A great big thank you to all of our volunteers and to the sponsors who make this assistance possible! In the field getting us started with Levi Wielenga were Kim & Ruth Brown, Don & Stacy Gilberg & Family, John Robertson, David Frueh, Dave Zimmer, Gary Krieger, Mike Platt, Larry Otis, Garry Deckert, Jan Van Dam, Leroy Spilde and Randy Thooft. It definitely takes a team like this to make the wheels turn! Did you know? Rural Fire Departments are a friend of Farm Rescue! Many times, the departments - usually volunteer - come out with a fire truck when our rigs are getting dirty to hose off the dirt and grime. This saves us a lot of power washing time and gets us to the next case earlier so we can help more people in less time! Thank you to all the fire departments that have helped us this year, and in years past. What a great group of people to work with! I’m excited to announce we have officially wrapped up Planting season of 2018! And did it safely. 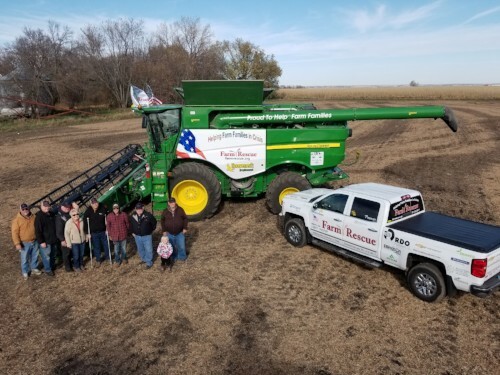 Crew 1 finished the year by planting soybeans at Finley, ND for a farmer fighting brain cancer. Crew 2 completed cases at Rosholt, SD (Shoulder injuries), Webster, SD (Cancer), and Ashley, ND (Brain Cancer). Fifteen farm families were assisted by Farm Rescue this planting season! Volunteers who helped the last week are Kim and Ruth Brown, Mike Wilson, Mike Youngblood, Steve Satterwaite, Jeff Preston, Clarence Kuss and Jeff Strand. Thank you to all the volunteers who made this a successful season! May 18, 2018 - The People! We just cannot emphasize the people enough! The people we help - extremely generous and like family despite their recent experiences. The people who volunteer - always smiling and so happy to be able to help, despite no compensation for their long hours. And the people who support us - the Farm Rescuers who sponsor, donate, share our mission or fundraise, despite not always getting to meet so many of those they are helping. All are sooo appreciated. 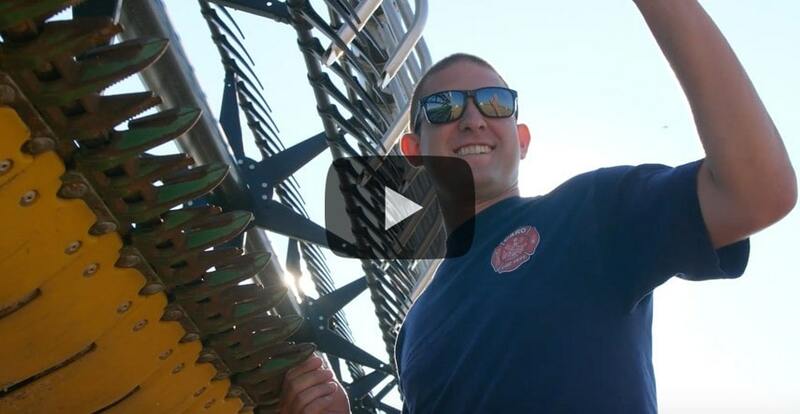 Take a deeper look at the people of Farm Rescue. Farmers are featured under the “2018 Assisted Farmers and Ranchers”. Volunteers under “Meet the Volunteers”. And sponsors under the "Sponsor" tab. Thank you to ALL of our people! 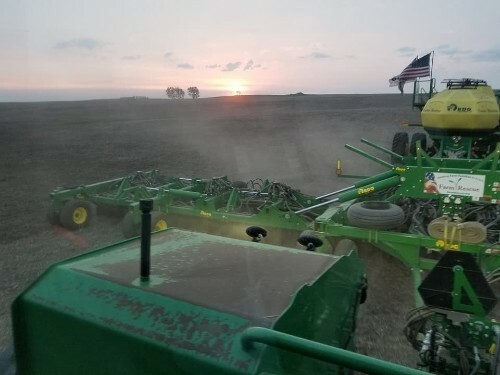 In the field, Crew 1 and 2 finished their wheat seeding, and began soybeans - they completed cases for wonderful families of Cayuga, ND (Heart Attack), Perth, ND (Cancer), Lisbon, ND (Coma, recovery) and Lidgerwood, ND (Surgery). Volunteers on site the last week are Tom Meyer, Mike Melaas, Mark Baumgarten, Clay Robertson, Mark Burton, John and Carol Andrews, Jeff Preston, Jim Lawrence, Mike Wilson and Lee Van Ruler. While we’ve been able to keep going without too many rain delays, we are also praying for adequate rain for all the crops this year, especially in the west where it is so needed. Lots of good happening now, right in your rural neighborhoods! Crew 1 arrived to Ryder, ND and planted small grains for a farmer recovering from an extended stay in the hospital. After completing assistance for them, they had a short move to Plaza, ND area. In Plaza, they planted a variety of small grains for a farmer fighting a brain tumor. They are now headed West towards the border of Montana. 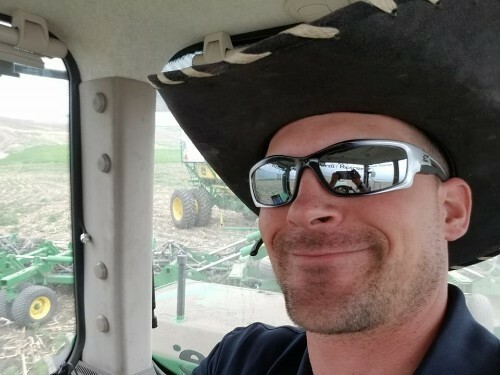 Meanwhile, to the South, Crew 2 moved to Elgin, ND and planted wheat for a farmer dealing with seizures, and also seeded for another who had a knee replacement. They then moved to Selfridge, ND and planted for a farmer who was recently in a farm accident. Currently they are en route to Cayuga, ND. We have had a great start to a late Spring, and look forward to good, productive days ahead. The volunteers are working hard to plant day and night alike so we can serve our farmers in a timely manner. Volunteers who have selflessly given the past week are Levi Wielenga, Tom Meyer, Mark Baumgarten, Mike Melaas, Jerry Burau, Garry Deckert, Clay Robertson, Mark Burton, Albert Lautenschlager, Ken Enstrom, Rich Thuesen, Lee Van Ruler, Kenneth Chyle, Jed Wall and John and Carol Andrews! Say a prayer for their safety, and the safety of all farmers during this time, and we will connect again next week! Farm Rescue planting crews are in full motion! Volunteers, Levi and Carol Wielenga, Garry Deckert, Alan Enger, Lee Van Ruler and Kenneth Chyle got the equipment set up, decalled and ready to go last week. 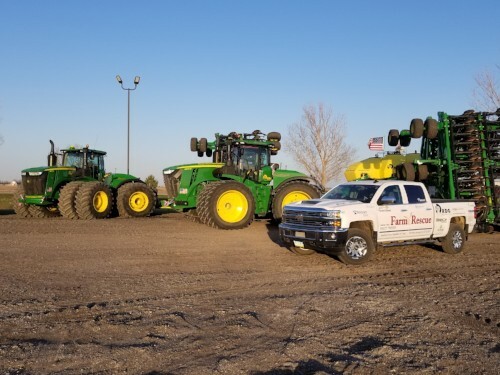 Crew 1 (Tom Meyer, Ken Enstrom, Jerry Burau and Rich Thuesen) is on the road today to Ryder, ND to plant small grains, and after already completing a wheat case near Long Lake, SD, Crew 2 (Kenneth Chyle and Lee Van Ruler) is now is headed for Elgin, ND. Please be careful on the roads as there is a lot of machinery moving around, and keep the farmers in your thoughts and prayers for a safe and productive season this May! As always, a big thank you to our sponsors that make this possible. A special thanks goes out to RDO Equipment Company for again supplying equipment to make planting possible!